The business of paper dolls is revived thanks to collectors and adults that wish to enjoy a second childhood. 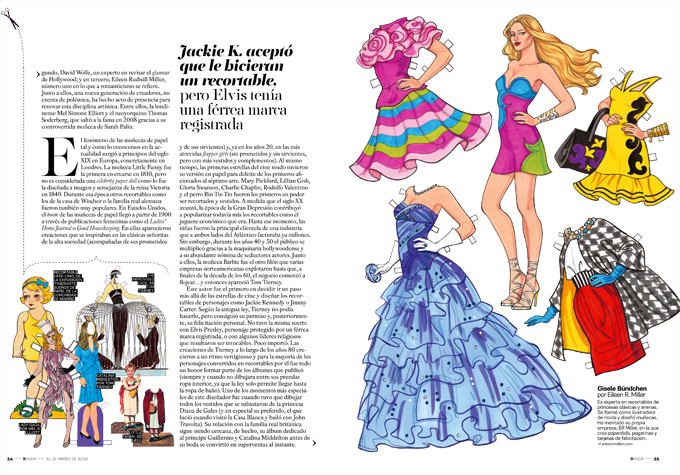 Three artists design exclusive creations for S MODA. We live in an age where technology monopolizes our existences. In a similar context, what significance does something supposedly passé as paper dolls have? Although it may seem surprising, they persist to exist against the passing of time. In fact, they are living a good commercial moment thanks to the millions of collectors that continue their devotion to the publication of books by the greatest paper doll illustrators of the world who have spent decades creating a parallel universe that enchants you and seems to not easily free you. Far from dying on the vine, the paper doll industry has used the Internet to broaden its horizons and, of course, reach out to old and new customers. A quick look at the Paperdollreview.com website reveals the wide variety of categories that exist in one area where, of course, a good pair of scissors is essential: American girls, brides, Barbie and her world, Disney characters, fairy godmothers, princess and queens, literature, film stars…this is just the beginning of a journey that also takes us to visit the Wild West, the Victorian era or, the political landscape (via the Kennedy family, Reagan or Obama). Along with all these options, several illustrators stand out as authentic idols. Firstly, the grand Tom Tierney, who at 83 years old, is still the King Midas of the cutouts; secondly, David Wolfe, an expert in Hollywood glamour, and third, Eileen Rudisill Miller, number one in terms of romanticism. Alongside them, a new generation of creators has emerged to renew this artistic discipline. Among them, the British Mel Simone Elliott and Thomas Soderberg from New York who shot to fame in 2008 thanks to his Sarah Palin paper doll book. The paper doll phenomenon as we know it today emerged in the early XIX century in Europe, particularly in London. 1810 brought the creation of the first paper doll called Little Fanny but was not considered as popular as the one that resembled Queen Victoria in 1840. During that time, other paper dolls of the House of Windsor or the German royal family were also very popular. In the USA, the paper doll boom began in 1900 through women’s publications such as Ladies’ Home Journal or Good Housekeeping. In the pages of those popular magazines, appeared paper doll creations inspired by classic ladies of society (accompanied by their boyfriends and their servants) and in the 20’s the most daring flapper girls were created (without boyfriends and without servants but with more dresses and accessories). At the same time, the first silent film stars were made into paper dolls to the delight of fans. Mary Pickford, Lillian Gish, Gloria Swanson, Charlie Chaplin, Rudolph Valentino and the dog Rin Tin Tin were the first to be cut out and dressed. As the twentieth century progressed, the Great Depression contributed to further popularize the paper doll as the economical toy that it was. Until then, girls from both sides of the Atlantic were the main customers for an industry that was already publishing millions. However, during the 40s and 50s, the clientele multiplied thanks to the Hollywood machine and its star system. Alongside them, Barbie helped explode the industry in North America until the late 60s when business began to slow down…and then Tom Tierney appeared. This illustrator was the first to decide to move beyond movie stars and design paper dolls on personalities such as Jackie Kennedy or Jimmy Carter. By law he could not use their image but after receiving permission to do so, his paper doll books were published successfully. That was not the case with Elvis Presley who was protected by an iron trademark, or religious leaders who remained untouchable. It mattered little. Tierney’s creations grew exponentially through the 80s and the public figures converted into paper dolls books found it an honor to become a part of his published works (provided that these books did not include underwear because the law only allowed the use of swimwear). One of the most special moments for this illustrator was drawing the dresses to be auctioned by the Diana, Princess of Wales (his favorite dress being the one worn to the White House when she danced with John Travolta). His relationship with the British royal family remains intact, having created a paper doll book dedicated to Prince William and Kate Middleton before their wedding. It became an instant sales success.